A transferase is any one of a class of enzymes that enact the transfer of specific functional groups (e.g. a methyl or glycosyl group) from one molecule (called the donor) to another (called the acceptor). They are involved in hundreds of different biochemical pathways throughout biology, and are integral to some of life’s most important processes. Transferases are involved in myriad reactions in the cell. Three examples of these reactions are the activity of coenzyme A (CoA) transferase, which transfers thiol esters, the action of N-acetyltransferase, which is part of the pathway that metabolizes tryptophan, and the regulation of pyruvate dehydrogenase (PDH), which converts pyruvate to acetyl CoA. Transferases are also utilized during translation. In this case, an amino acid chain is the functional group transferred by a peptidyl transferase. The transfer involves the removal of the growing amino acid chain from the tRNA molecule in the A-site of the ribosome and its subsequent addition to the amino acid attached to the tRNA in the P-site. In the above reaction, X would be the donor, and Y would be the acceptor. "Group" would be the functional group transferred as a result of transferase activity. The donor is often a coenzyme. Some of the most important discoveries relating to transferases occurred as early as the 1930s. Earliest discoveries of transferase activity occurred in other classifications of enzymes, including Beta-galactosidase, protease, and acid/base phosphatase. Prior to the realization that individual enzymes were capable of such a task, it was believed that two or more enzymes enacted functional group transfers. Biodegradation of dopamine via catechol-O-methyltransferase (along with other enzymes). The mechanism for dopamine degradation led to the Nobel Prize in Physiology or Medicine in 1970. Transamination, or the transfer of an amine (or NH2) group from an amino acid to a keto acid by an aminotransferase (also known as a "transaminase"), was first noted in 1930 by D. M. Needham, after observing the disappearance of glutamic acid added to pigeon breast muscle. This observance was later verified by the discovery of its reaction mechanism by Braunstein and Kritzmann in 1937. Their analysis showed that this reversible reaction could be applied to other tissues. This assertion was validated by Rudolf Schoenheimer's work with radioisotopes as tracers in 1937. This in turn would pave the way for the possibility that similar transfers were a primary means of producing most amino acids via amino transfer. Another such example of early transferase research and later reclassification involved the discovery of uridyl transferase. In 1953, the enzyme UDP-glucose pyrophosphorylase was shown to be a transferase, when it was found that it could reversibly produce UTP and G1P from UDP-glucose and an organic pyrophosphate. Another example of historical significance relating to transferase is the discovery of the mechanism of catecholamine breakdown by catechol-O-methyltransferase. This discovery was a large part of the reason for Julius Axelrod’s 1970 Nobel Prize in Physiology or Medicine (shared with Sir Bernard Katz and Ulf von Euler). Classification of transferases continues to this day, with new ones being discovered frequently. An example of this is Pipe, a sulfotransferase involved in the dorsal-ventral patterning of Drosophilia. Initially, the exact mechanism of Pipe was unknown, due to a lack of information on its substrate. Research into Pipe's catalytic activity eliminated the likelihood of it being a heparan sulfate glycosaminoglycan. Further research has shown that Pipe targets the ovarian structures for sulfation. Pipe is currently classified as a Drosophilia heparan sulfate 2-O-sulfotransferase. However, other accepted names are more frequently used for transferases, and are often formed as "acceptor grouptransferase" or "donor grouptransferase." For example, a DNA methyltransferase is a transferase that catalyzes the transfer of a methyl group to a DNA acceptor. In practice, many molecules are not referred to using this terminology due to more prevalent common names. For example, RNA Polymerase is the modern common name for what was formerly known as RNA nucleotidyltransferase, a kind of nucleotidyl transferase that transfers nucleotides to the 3’ end of a growing RNA strand. In the EC system of classification, the accepted name for RNA Polymerase is DNA-directed RNA polymerase. Described primarily based on the type of biochemical group transferred, transferases can be divided into ten categories (based on the EC Number classification). These categories comprise over 450 different unique enzymes. In the EC numbering system, transferases have been given a classification of EC2. Hydrogen is not considered a functional group when it comes to transferase targets; instead, hydrogen transfer is included under oxidoreductases, due to electron transfer considerations. EC 2.1 includes enzymes that transfer single-carbon groups. This category consists of transfers of methyl, hydroxymethyl, formyl, carboxy, carbamoyl, and amido groups. Carbamoyltransferases, as an example, transfer a carbamoyl group from one molecule to another. Carbamoyl groups follow the formula NH2CO. In ATCase such a transfer is written as Carbamyl phosphate + L-aspertate L-carbamyl aspartate + phosphate. Enzymes that transfer aldehyde or ketone groups and included in EC 2.2. This category consists of various transketolases and transaldolases. Transaldolase, the namesake of aldehyde transferases, is an important part of the pentose phosphate pathway. The reaction it catalyzes consists of a transfer of a dihydroxyacetone functional group to Glyceraldehyde 3-phosphate (also known as G3P). The reaction is as follows: sedoheptulose 7-phosphate + glyceraldehyde 3-phosphate erythrose 4-phosphate + fructose 6-phosphate. Transfer of acyl groups or acyl groups that become alkyl groups during the process of being transferred are key aspects of EC 2.3. Further, this category also differentiates between amino-acyl and non-amino-acyl groups. Peptidyl transferase is a ribozyme that facilitates formation of peptide bonds during translation. As an aminoacyltransferase, it catalyzes the transfer of a peptide to an aminoacyl-tRNA, following this reaction: peptidyl-tRNAA + aminoacyl-tRNAB tRNAA + peptidyl aminoacyl-tRNAB. EC 2.4 includes enzymes that transfer glycosyl groups, as well as those that transfer hexose and pentose. Glycosyltransferase is a subcategory of EC 2.4 transferases that is involved in biosynthesis of disaccharides and polysaccharides through transfer of monosaccharides to other molecules. An example of a prominent glycosyltransferase is lactose synthase which is a dimer possessing two protein subunits. Its primary action is to produce lactose from glucose and UDP-galactose. This occurs via the following pathway: UDP-β-D-galactose + D-glucose UDP + lactose. EC 2.5 relates to enzymes that transfer alkyl or aryl groups, but does not include methyl groups. This is in contrast to functional groups that become alkyl groups when transferred, as those are included in EC 2.3. EC 2.5 currently only possesses one sub-class: Alkyl and aryl transferases. Cysteine synthase, for example, catalyzes the formation of acetic acids and cysteine from O3-acetyl-L-serine and hydrogen sulfide: O3-acetyl-L-serine + H2S L-cysteine + acetate. The grouping consistent with transfer of nitrogenous groups is EC 2.6. This includes enzymes like transaminase (also known as "aminotransferase"), and a very small number of oximinotransferases and other nitrogen group transferring enzymes. EC 2.6 previously included amidinotransferase but it has since been reclassified as a subcategory of EC 2.1 (single-carbon transferring enzymes). In the case of aspartate transaminase, which can act on tyrosine, phenylalanine, and tryptophan, it reversibly transfers an amino group from one molecule to the other. The reaction, for example, follows the following order: L-aspartate +2-oxoglutarate oxaloacetate + L-glutamate. While EC 2.7 includes enzymes that transfer phosphorus-containing groups, it also includes nuclotidyl transferases as well. Sub-category phosphotransferase is divided up in categories based on the type of group that accepts the transfer. Groups that are classified as phosphate acceptors include: alcohols, carboxy groups, nitrogenous groups, and phosphate groups. Further constituents of this subclass of transferases are various kinases. A prominent kinase is cyclin-dependent kinase (or CDK), which comprises a sub-family of protein kinases. As their name implies, CDKs are heavily dependent on specific cyclin molecules for activation. Once combined, the CDK-cyclin complex is capable of enacting its function within the cell cycle. The reaction catalyzed by CDK is as follows: ATP + a target protein ADP + a phosphoprotein. Transfer of sulfur-containing groups is covered by EC 2.8 and is subdivided into the subcategories of sulfurtransferases, sulfotransferases, and CoA-transferases, as well as enzymes that transfer alkylthio groups. A specific group of sulfotransferases are those that use PAPS as a sulfate group donor. Within this group is alcohol sulfotransferase which has a broad targeting capacity. Due to this, alcohol sulfotransferase is also known by several other names including "hydroxysteroid sulfotransferase," "steroid sulfokinase," and "estrogen sulfotransferase." Decreases in its activity has been linked to human liver disease. This transferase acts via the following reaction: 3'-phosphoadenylyl sulfate + an alcohol adenosine 3',5'bisphosphate + an alkyl sulfate. EC 2.9 includes enzymes that transfer selenium-containing groups. This category only contains two transferases, and thus is one of the smallest categories of transferase. Selenocysteine synthase, which was first added to the classification system in 1999, converts seryl-tRNA(Sec UCA) into selenocysteyl-tRNA(Sec UCA). The category of EC 2.10 includes enzymes that transfer molybdenum or tungsten-containing groups. 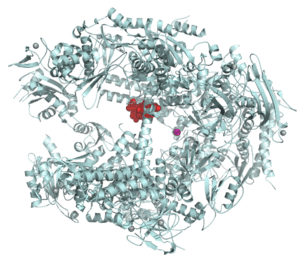 However, as of 2011, only one enzyme has been added: molybdopterin molybdotransferase. This enzyme is a component of MoCo biosynthesis in Escherichia coli. The reaction it catalyzes is as follows: adenylyl-molybdopterin + molybdate molybdenum cofactor + AMP. The A and B transferases are the foundation of the human ABO blood group system. Both A and B transferases are glycosyltransferases, meaning they transfer a sugar molecule onto an H-antigen. This allows H-antigen to synthesize the glycoprotein and glycolipid conjugates that are known as the A/B antigens. The full name of A transferase is alpha 1-3-N-acetylgalactosaminyltransferase and its function in the cell is to add N-acetylgalactosamine to H-antigen, creating A-antigen. :55 The full name of B transferase is alpha 1-3-galactosyltransferase, and its function in the cell is to add a galactose molecule to H-antigen, creating B-antigen. Transferase deficiencies are at the root of many common illnesses. The most common result of a transferase deficiency is a buildup of a cellular product. Succinyl-CoA:3-ketoacid CoA transferase deficiency (or SCOT deficiency) leads to a buildup of ketones. Ketones are created upon the breakdown of fats in the body and are an important energy source. Inability to utilize ketones leads to intermittent ketoacidosis, which usually first manifests during infancy. Disease sufferers experience nausea, vomiting, inability to feed, and breathing difficulties. In extreme cases, ketoacidosis can lead to coma and death. The deficiency is caused by mutation in the gene OXTC1. Treatments mostly rely on controlling the diet of the patient. Carnitine palmitoyltransferase II deficiency (also known as CPT-II deficiency) leads to an excess long chain fatty acids, as the body lacks the ability to transport fatty acids into the mitochondria to be processed as a fuel source. The disease is caused by a defect in the gene CPT2. This deficiency will present in patients in one of three ways: lethal neonatal, severe infantile hepatocardiomuscular, and myopathic form. The myopathic is the least severe form of the deficiency and can manifest at any point in the lifespan of the patient. The other two forms appear in infancy. Common symptoms of the lethal neonatal form and the severe infantile forms are liver failure, heart problems, seizures and death. The myopathic form is characterized by muscle pain and weakness following vigorous exercise. Treatment generally includes dietary modifications and carnitine supplements. Galactosemia results from an inability to process galactose, a simple sugar. This deficiency occurs when the gene for galactose-1-phosphate uridylyltransferase (GALT) has any number of mutations, leading to a deficiency in the amount of GALT produced. There are two forms of Galactosemia: classic and Duarte. Duarte galactosemia is generally less severe than classic galactosemia and is caused by a deficiency of galactokinase. Galactosemia renders infants unable to process the sugars in breast milk, which leads to vomiting and anorexia within days of birth. Most symptoms of the disease are caused by a buildup of galactose-1-phosphate in the body. Common symptoms include liver failure, sepsis, failure to grow, and mental impairment, among others. Buildup of a second toxic substance, galactitol, occurs in the lenses of the eyes, causing cataracts. Currently, the only available treatment is early diagnosis followed by adherence to a diet devoid of lactose, and prescription of antibiotics for infections that may develop. Choline acetyltransferase (also known as ChAT or CAT) is an important enzyme which produces the neurotransmitter acetylcholine. Acetylcholine is involved in many neuropsychic functions such as memory, attention, sleep and arousal. The enzyme is globular in shape and consists of a single amino acid chain. ChAT functions to transfer an acetyl group from acetyl co-enzyme A to choline in the synapses of nerve cells and exists in two forms: soluble and membrane bound. The ChAT gene is located on chromosome 10. Decreased expression of ChAT is one of the hallmarks of Alzheimer's disease. Patients with Alzheimer's disease show a 30 to 90% reduction in activity in several regions of the brain, including the temporal lobe, the parietal lobe and the frontal lobe. However, ChAT deficiency is not believed to be the main cause of this disease. Patients with ALS show a marked decrease in ChAT activity in motor neurons in the spinal cord and brain. Low levels of ChAT activity are an early indication of the disease and are detectable long before motor neurons begin to die. This can even be detected before the patient is symptomatic. Patients with Huntington's also show a marked decrease in ChAT production. Though the specific cause of the reduced production is not clear, it is believed that the death of medium-sized motor neurons with spiny dendrites leads to the lower levels of ChAT production. Patients with Schizophrenia also exhibit decreased levels of ChAT, localized to the mesopontine tegment of the brain and the nucleus accumbens, which is believed to correlate with the decreased cognitive functioning experienced by these patients. Recent studies have shown that SIDS infants show decreased levels of ChAT in both the hypothalamus and the striatum. SIDS infants also display fewer neurons capable of producing ChAT in the vagus system. These defects in the medulla could lead to an inability to control essential autonomic functions such as the cardiovascular and respiratory systems. CMS is a family of diseases that are characterized by defects in neuromuscular transmission which leads to recurrent bouts of apnea (inability to breathe) that can be fatal. ChAT deficiency is implicated in myasthenia syndromes where the transition problem occurs presynaptically. These syndromes are characterized by the patients’ inability to resynthesize acetylcholine. Terminal transferases are transferases that can be used to label DNA or to produce plasmid vectors. It accomplishes both of these tasks by adding deoxynucleotides in the form of a template to the downstream end or 3' end of an existing DNA molecule. Terminal transferase is one of the few DNA polymerases that can function without an RNA primer. The family of glutathione transferases (GST) is extremely diverse, and therefore can be used for a number of biotechnological purposes. Plants use glutathione transferases as a means to segregate toxic metals from the rest of the cell. These glutathione transferases can be used to create biosensors to detect contaminants such as herbicides and insecticides. Glutathione transferases are also used in transgenic plants to increase resistance to both biotic and abiotic stress. Glutathione transferases are currently being explored as targets for anti-cancer medications due to their role in drug resistance. Further, glutathione transferase genes have been investigated due to their ability to prevent oxidative damage and have shown improved resistance in transgenic cultigens. Currently the only available commercial source of natural rubber is the Hevea plant (Hevea brasiliensis). Natural rubber is superior to synthetic rubber in a number of commercial uses. Efforts are being made to produce transgenic plants capable of synthesizing natural rubber, including tobacco and sunflower. These efforts are focused on sequencing the subunits of the rubber transferase enzyme complex in order to transfect these genes into other plants. ↑ "EC 2.7.7 Nucleotidyltransferases". Enzyme Nomenclature. Recommendations. Nomenclature Committee of the International Union of Biochemistry and Molecular Biology (NC-IUBMB). Retrieved 14 November 2013. ↑ "Transferase". Genetics Home Reference. National Institute of Health. Retrieved 4 November 2013. ↑ Moore SA, Jencks WP (Sep 1982). "Model reactions for CoA transferase involving thiol transfer. Anhydride formation from thiol esters and carboxylic acids". The Journal of Biological Chemistry. 257 (18): 10882–92. PMID 6955307. ↑ Wishart D. "Tryptophan Metabolism". Small Molecule Pathway Database. Department of Computing Science and Biological Sciences, University of Alberta. Retrieved 4 November 2013. ↑ Herbst EA, MacPherson RE, LeBlanc PJ, Roy BD, Jeoung NH, Harris RA, Peters SJ (Jan 2014). "Pyruvate dehydrogenase kinase-4 contributes to the recirculation of gluconeogenic precursors during postexercise glycogen recovery". American Journal of Physiology. Regulatory, Integrative and Comparative Physiology. 306 (2): R102–7. doi:10.1152/ajpregu.00150.2013. PMID 24305065. ↑ Watson, James D. Molecular Biology of the Gene. Upper Saddle River, NJ: Pearson, 2013. Print. ↑ Boyce S, Tipton KF (2005). "Enzyme Classification and Nomenclature". ELS. doi:10.1038/npg.els.0003893. ISBN 0470016175. ↑ Morton RK (Jul 1953). "Transferase activity of hydrolytic enzymes". Nature. 172 (4367): 65–8. doi:10.1038/172065a0. PMID 13072573. ↑ Cohen PP (Sep 1939). "Transamination in pigeon breast muscle". The Biochemical Journal. 33 (9): 1478–87. doi:10.1042/bj0331478. PMC 1264599 . PMID 16747057. ↑ Snell EE, Jenkins WT (December 1959). "The mechanism of the transamination reaction". Journal of Cellular and Comparative Physiology. 54 (S1): 161–177. doi:10.1002/jcp.1030540413. ↑ Braunstein AE, Kritzmann MG (1937). "Formation and Breakdown of Amino-acids by Inter-molecular Transfer of the Amino Group". Nature. 140 (3542): 503–504. doi:10.1038/140503b0. ↑ Schoenheimer R (1949). The Dynamic State of Body Constituents. Hafner Publishing Co Ltd. ISBN 978-0-02-851800-8. ↑ Guggenheim KY (Nov 1991). "Rudolf Schoenheimer and the concept of the dynamic state of body constituents". The Journal of Nutrition. 121 (11): 1701–4. PMID 1941176. ↑ Hird FJ, Rowsell EV (Sep 1950). "Additional transaminations by insoluble particle preparations of rat liver". Nature. 166 (4221): 517–8. doi:10.1038/166517a0. PMID 14780123. ↑ Munch-Petersen A, Kalckar HM, Cutolo E, Smith EE (Dec 1953). "Uridyl transferases and the formation of uridine triphosphate; enzymic production of uridine triphosphate: uridine diphosphoglucose pyrophosphorolysis". Nature. 172 (4388): 1036–7. doi:10.1038/1721036a0. PMID 13111246. ↑ "Physiology or Medicine 1970 - Press Release". Nobelprize.org. Nobel Media AB. Retrieved 5 November 2013. ↑ Lambalot RH, Gehring AM, Flugel RS, Zuber P, LaCelle M, Marahiel MA, Reid R, Khosla C, Walsh CT (Nov 1996). "A new enzyme superfamily - the phosphopantetheinyl transferases". Chemistry & Biology. 3 (11): 923–36. doi:10.1016/S1074-5521(96)90181-7. PMID 8939709. ↑ Wongtrakul J, Pongjaroenkit S, Leelapat P, Nachaiwieng W, Prapanthadara LA, Ketterman AJ (Mar 2010). "Expression and characterization of three new glutathione transferases, an epsilon (AcGSTE2-2), omega (AcGSTO1-1), and theta (AcGSTT1-1) from Anopheles cracens (Diptera: Culicidae), a major Thai malaria vector". Journal of Medical Entomology. 47 (2): 162–71. doi:10.1603/me09132. PMID 20380296. ↑ Sen J, Goltz JS, Stevens L, Stein D (Nov 1998). "Spatially restricted expression of pipe in the Drosophila egg chamber defines embryonic dorsal-ventral polarity". Cell. 95 (4): 471–81. doi:10.1016/s0092-8674(00)81615-3. PMID 9827800. ↑ Moussian B, Roth S (Nov 2005). "Dorsoventral axis formation in the Drosophila embryo--shaping and transducing a morphogen gradient". Current Biology. 15 (21): R887–99. doi:10.1016/j.cub.2005.10.026. PMID 16271864. ↑ Zhu X, Sen J, Stevens L, Goltz JS, Stein D (Sep 2005). "Drosophila pipe protein activity in the ovary and the embryonic salivary gland does not require heparan sulfate glycosaminoglycans". Development. 132 (17): 3813–22. doi:10.1242/dev.01962. PMID 16049108. ↑ Zhang Z, Stevens LM, Stein D (Jul 2009). "Sulfation of eggshell components by Pipe defines dorsal-ventral polarity in the Drosophila embryo". Current Biology. 19 (14): 1200–5. doi:10.1016/j.cub.2009.05.050. PMID 19540119. ↑ Xu D, Song D, Pedersen LC, Liu J (Mar 2007). "Mutational study of heparan sulfate 2-O-sulfotransferase and chondroitin sulfate 2-O-sulfotransferase". The Journal of Biological Chemistry. 282 (11): 8356–67. doi:10.1074/jbc.M608062200. PMID 17227754. 1 2 "EC 2 Introduction". School of Biological & Chemical Sciences at Queen Mary, University of London. Nomenclature Committee of the International Union of Biochemistry and Molecular Biology (NC-IUBMB). Retrieved 5 November 2013. ↑ Shaw WV, Tsai L, Stadtman ER (Feb 1966). "The enzymatic synthesis of N-methylglutamic acid". The Journal of Biological Chemistry. 241 (4): 935–45. PMID 5905132. ↑ Lower S. "Naming Chemical Substances". Chem1 General Chemistry Virtual Textbook. Retrieved 13 November 2013. ↑ Hausmann R. To grasp the essence of life: a history of molecular biology. Dordrecht: Springer. pp. 198–199. ISBN 978-90-481-6205-5. ↑ "EC 2.7.7.6". IUBMB Enzyme Nomenclature. Nomenclature Committee of the International Union of Biochemistry and Molecular Biology (NC-IUBMB). Retrieved 12 November 2013. 1 2 "EC2 Transferase Nomenclature". School of Biological & Chemical Sciences at Queen Mary, University of London. Nomenclature Committee of the International Union of Biochemistry and Molecular Biology (NC-IUBMB). Retrieved 4 November 2013. 1 2 "Transferase". Encyclopædia Britannica. Encyclopædia Britannica, Inc. Retrieved 28 July 2016. ↑ "EC 2.1.3: Carboxy- and Carbamoyltransferases". School of Biological & Chemical Sciences at Queen Mary, University of London. Nomenclature Committee of the International Union of Biochemistry and Molecular Biology (NC-IUBMB). Retrieved 25 November 2013. ↑ "carbamoyltransferase". The Free Dictionary. Farlex, Inc. Retrieved 25 November 2013. ↑ "carbamoyl group (CHEBI:23004)". ChEBI: The database and ontology of Chemical Entities of Biological Interest. European Molecular Biology Laboratory. Retrieved 25 November 2013. ↑ Reichard P, Hanshoff G (1956). "Aspartate Carbamyl Transferase from Escherichia Coli" (PDF). Acta Chemica Scandinavica: 548–566. ↑ "ENZYME class 2.2.1". ExPASy: Bioinformatics Resource Portal. Swiss Institute of Bioinformatics. Retrieved 25 November 2013. ↑ "Pentose Phosphate Pathway". Molecular Biochemistry II Notes. The Biochemistry and Biophysics Program at Renssalaer Polytechnic Institute. Retrieved 25 November 2013. ↑ "EC 2.2.1.2 Transaldolase". 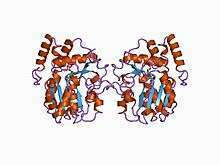 Enzyme Structures Database. European Molecular Biology Laboratory. Retrieved 25 November 2013. ↑ Voorhees RM, Weixlbaumer A, Loakes D, Kelley AC, Ramakrishnan V (May 2009). "Insights into substrate stabilization from snapshots of the peptidyl transferase center of the intact 70S ribosome". Nature Structural & Molecular Biology. 16 (5): 528–33. doi:10.1038/nsmb.1577. PMC 2679717 . PMID 19363482. ↑ "ENZYME entry: EC 2.3.2.12". ExPASy: Bioinformatics Resource Portal. Swiss Institute of Bioinformatics. Retrieved 26 November 2013. ↑ "Keyword Glycosyltransferase". UniProt. UniProt Consortium. Retrieved 26 November 2013. ↑ Fitzgerald DK, Brodbeck U, Kiyosawa I, Mawal R, Colvin B, Ebner KE (Apr 1970). "Alpha-lactalbumin and the lactose synthetase reaction". The Journal of Biological Chemistry. 245 (8): 2103–8. PMID 5440844. ↑ "ENZYME entry: EC 2.4.1.22". ExPASy: Bioinformatics Resource Portal. Swiss Institute of Bioinformatics. Retrieved 26 November 2013. ↑ "EC 2.5". IntEnz. European Molecular Biology Laboratory. Retrieved 26 November 2013. ↑ Qabazard B, Ahmed S, Li L, Arlt VM, Moore PK, Stürzenbaum SR (2013). "C. elegans aging is modulated by hydrogen sulfide and the sulfhydrylase/cysteine synthase cysl-2". PLOS ONE. 8 (11): e80135. doi:10.1371/journal.pone.0080135. PMC 3832670 . PMID 24260346. ↑ "EC 2.6.2". IUBMB Enzyme Nomenclatur. Nomenclature Committee of the International Union of Biochemistry and Molecular Biology (NC-IUBMB). Retrieved 28 November 2013. ↑ Kirsch JF, Eichele G, Ford GC, Vincent MG, Jansonius JN, Gehring H, Christen P (Apr 1984). "Mechanism of action of aspartate aminotransferase proposed on the basis of its spatial structure". Journal of Molecular Biology. 174 (3): 497–525. doi:10.1016/0022-2836(84)90333-4. PMID 6143829. ↑ "Enzyme entry:2.6.1.1". ExPASy: Bioinformatics Resource Portal. Swiss Institute of Bioinformatics. Retrieved 28 November 2013. ↑ "EC 2.7". School of Biological & Chemical Sciences at Queen Mary, University of London. Nomenclature Committee of the International Union of Biochemistry and Molecular Biology (NC-IUBMB). Retrieved 4 December 2013. ↑ Yee A, Wu L, Liu L, Kobayashi R, Xiong Y, Hall FL (Jan 1996). "Biochemical characterization of the human cyclin-dependent protein kinase activating kinase. Identification of p35 as a novel regulatory subunit". The Journal of Biological Chemistry. 271 (1): 471–7. PMID 8550604. ↑ Lewis R (2008). Human genetics : concepts and applications (8th ed.). Boston: McGraw-Hill/Higher Education. p. 32. ISBN 978-0-07-299539-8. ↑ "ENZYME Entry: EC 2.7.11.22". ExPASy: Bioinformatics Resource Portal. Swiss Institute of Bioinformatics. Retrieved 4 December 2013. ↑ "1aqy Summary". Protein Data Bank in Europe Bringing Structure to Biology. The European Bioinformatics Institute. Retrieved 11 December 2013. ↑ "EC 2.8 Transferring Sulfur-Containing Groups". School of Biological & Chemical Sciences at Queen Mary, University of London. Nomenclature Committee of the International Union of Biochemistry and Molecular Biology (NC-IUBMB). Retrieved 11 December 2013. ↑ Negishi M, Pedersen LG, Petrotchenko E, Shevtsov S, Gorokhov A, Kakuta Y, Pedersen LC (Jun 2001). "Structure and function of sulfotransferases". Archives of Biochemistry and Biophysics. 390 (2): 149–57. doi:10.1006/abbi.2001.2368. PMID 11396917. ↑ "Enzyme 2.8.2.2". Kegg: DBGET. Kyoto University Bioinformatics Center. Retrieved 11 December 2013. ↑ Ou Z, Shi X, Gilroy RK, Kirisci L, Romkes M, Lynch C, Wang H, Xu M, Jiang M, Ren S, Gramignoli R, Strom SC, Huang M, Xie W (Jan 2013). "Regulation of the human hydroxysteroid sulfotransferase (SULT2A1) by RORα and RORγ and its potential relevance to human liver diseases". Molecular Endocrinology. 27 (1): 106–15. doi:10.1210/me.2012-1145. PMID 23211525. ↑ Sekura RD, Marcus CJ, Lyon ES, Jakoby WB (May 1979). "Assay of sulfotransferases". Analytical Biochemistry. 95 (1): 82–6. doi:10.1016/0003-2697(79)90188-x. PMID 495970. ↑ "EC 2.9.1". School of Biological & Chemical Sciences at Queen Mary, University of London. Nomenclature Committee of the International Union of Biochemistry and Molecular Biology (NC-IUBMB). Retrieved 11 December 2013. ↑ Forchhammer K, Böck A (Apr 1991). "Selenocysteine synthase from Escherichia coli. Analysis of the reaction sequence". The Journal of Biological Chemistry. 266 (10): 6324–8. PMID 2007585. ↑ "EC 2.10.1". School of Biological & Chemical Sciences at Queen Mary, University of London. Nomenclature Committee of the International Union of Biochemistry and Molecular Biology (NC-IUBMB). Retrieved 11 December 2013. ↑ Nichols JD, Xiang S, Schindelin H, Rajagopalan KV (Jan 2007). "Mutational analysis of Escherichia coli MoeA: two functional activities map to the active site cleft". Biochemistry. 46 (1): 78–86. doi:10.1021/bi061551q. PMID 17198377. ↑ Wünschiers R, Jahn M, Jahn D, Schomburg I, Peifer S, Heinzle E, Burtscher H, Garbe J, Steen A, Schobert M, Oesterhelt D, Wachtveitl J, Chang A (2010). "Chapter 3: Metabolism". In Michal G, Schomburg D. Biochemical Pathways: an Atlas of Biochemistry and Molecular Biology (2nd ed.). Oxford: Wiley-Blackwell. p. 140. doi:10.1002/9781118657072.ch3. ISBN 9780470146842. 1 2 Nishida C, Tomita T, Nishiyama M, Suzuki R, Hara M, Itoh Y, Ogawa H, Okumura K, Nishiyama C (2011). "B-transferase with a Pro234Ser substitution acquires AB-transferase activity". Bioscience, Biotechnology, and Biochemistry. 75 (8): 1570–5. doi:10.1271/bbb.110276. PMID 21821934. 1 2 "ABO ABO blood group (transferase A, alpha 1-3-N-acetylgalactosaminyltransferase; transferase B, alpha 1-3-galactosyltransferase) [ Homo sapiens (human) ]". NCBI. Retrieved 2 December 2013. 1 2 3 4 Datta SP, Smith GH, Campbell PN (2000). Oxford Dictionary of Biochemistry and Molecular Biology (Rev. ed.). Oxford: Oxford Univ. Press. ISBN 978-0-19-850673-7. ↑ O'Neil D. "ABO Blood Groups". Human Blood: An Introduction to Its Components and Types. Behavioral Sciences Department, Palomar College. Retrieved 2 December 2013. ↑ "ABO Blood Group (Transferase A, Alpha 1-3-N-Acetylgalactosaminyltransferase;Transferase B, Alpha 1-3-Galactosyltransferase)". GeneCards: The Human Gene Compendium. Weizmann Institute of Science. Retrieved 2 December 2013. ↑ Moran, Lawrence. "Human ABO Gene". Retrieved 2 December 2013. ↑ Kidd, Kenneth. "ABO blood group (transferase A, alpha 1-3-N-acetylgalactosaminyltransferase; transferase B, alpha 1-3-galactosyltransferase)". Retrieved 2 December 2013. ↑ "Succinyl-CoA:3-ketoacid CoA transferase deficiency". Genetics Home Reference. National Institute of Health. Retrieved 4 November 2013. 1 2 3 4 "SUCCINYL-CoA:3-OXOACID CoA TRANSFERASE DEFICIENCY". OMIM. Retrieved 22 November 2013. ↑ "SCOT deficiency". NIH. Retrieved 22 November 2013. ↑ "Succinyl-CoA 3-Oxoacid Transferase Deficiency" (PDF). Climb National Information Centre. Retrieved 22 November 2013. ↑ "Carnitine plamitoyltransferase I deficiency". Genetics Home Reference. National Institute of Health. Retrieved 4 November 2013. 1 2 3 4 5 6 7 Weiser, Thomas. "Carnitine Palmitoyltransferase II Deficiency". NIH. Retrieved 22 November 2013. ↑ "Galactosemia". Genetics Home Reference. National Institute of Health. Retrieved 4 November 2013. ↑ Dobrowolski SF, Banas RA, Suzow JG, Berkley M, Naylor EW (Feb 2003). "Analysis of common mutations in the galactose-1-phosphate uridyl transferase gene: new assays to increase the sensitivity and specificity of newborn screening for galactosemia". The Journal of Molecular Diagnostics. 5 (1): 42–7. doi:10.1016/S1525-1578(10)60450-3. PMC 1907369 . PMID 12552079. ↑ Murphy M, McHugh B, Tighe O, Mayne P, O'Neill C, Naughten E, Croke DT (Jul 1999). "Genetic basis of transferase-deficient galactosaemia in Ireland and the population history of the Irish Travellers". European Journal of Human Genetics. 7 (5): 549–54. doi:10.1038/sj.ejhg.5200327. PMID 10439960. ↑ Mahmood U, Imran M, Naik SI, Cheema HA, Saeed A, Arshad M, Mahmood S (Nov 2012). "Detection of common mutations in the GALT gene through ARMS". Gene. 509 (2): 291–4. doi:10.1016/j.gene.2012.08.010. PMID 22963887. 1 2 3 "Galactosemia". NORD. Retrieved 22 November 2013. ↑ Berry GT (2000). "Classic Galactosemia and Clinical Variant Galactosemia". GeneReviews [Internet]. PMID 20301691. ↑ Bosch AM (Aug 2006). "Classical galactosaemia revisited". Journal of Inherited Metabolic Disease. 29 (4): 516–25. doi:10.1007/s10545-006-0382-0. PMID 16838075. ↑ Karadag N, Zenciroglu A, Eminoglu FT, Dilli D, Karagol BS, Kundak A, Dursun A, Hakan N, Okumus N (2013). "Literature review and outcome of classic galactosemia diagnosed in the neonatal period". Clinical Laboratory. 59 (9-10): 1139–46. doi:10.7754/clin.lab.2013.121235. PMID 24273939. ↑ Strauss WL, Kemper RR, Jayakar P, Kong CF, Hersh LB, Hilt DC, Rabin M (Feb 1991). "Human choline acetyltransferase gene maps to region 10q11-q22.2 by in situ hybridization". Genomics. 9 (2): 396–8. doi:10.1016/0888-7543(91)90273-H. PMID 1840566. ↑ Braida D, Ponzoni L, Martucci R, Sparatore F, Gotti C, Sala M (May 2014). "Role of neuronal nicotinic acetylcholine receptors (nAChRs) on learning and memory in zebrafish". Psychopharmacology. 231 (9): 1975–85. doi:10.1007/s00213-013-3340-1. PMID 24311357. ↑ Stone TW (Sep 1972). "Cholinergic mechanisms in the rat somatosensory cerebral cortex". The Journal of Physiology. 225 (2): 485–99. doi:10.1113/jphysiol.1972.sp009951. PMC 1331117 . PMID 5074408. ↑ Guzman MS, De Jaeger X, Drangova M, Prado MA, Gros R, Prado VF (Mar 2013). "Mice with selective elimination of striatal acetylcholine release are lean, show altered energy homeostasis and changed sleep/wake cycle". Journal of Neurochemistry. 124 (5): 658–69. doi:10.1111/jnc.12128. PMID 23240572. 1 2 3 4 5 6 Oda Y (Nov 1999). "Choline acetyltransferase: the structure, distribution and pathologic changes in the central nervous system" (PDF). Pathology International. 49 (11): 921–37. doi:10.1046/j.1440-1827.1999.00977.x. PMID 10594838. ↑ "Choline O-Acetyltransferase". GeneCards: The Human Gene Compendium. Weizmann Institute of Science. Retrieved 5 December 2013. ↑ Szigeti C, Bencsik N, Simonka AJ, Legradi A, Kasa P, Gulya K (May 2013). "Long-term effects of selective immunolesions of cholinergic neurons of the nucleus basalis magnocellularis on the ascending cholinergic pathways in the rat: a model for Alzheimer's disease". Brain Research Bulletin. 94: 9–16. doi:10.1016/j.brainresbull.2013.01.007. PMID 23357177. ↑ González-Castañeda RE, Sánchez-González VJ, Flores-Soto M, Vázquez-Camacho G, Macías-Islas MA, Ortiz GG (Mar 2013). "Neural restrictive silencer factor and choline acetyltransferase expression in cerebral tissue of Alzheimer's Disease patients: A pilot study". Genetics and Molecular Biology. 36 (1): 28–36. doi:10.1590/S1415-47572013000100005. PMC 3615522 . PMID 23569405. ↑ Rowland LP, Shneider NA (May 2001). "Amyotrophic lateral sclerosis". The New England Journal of Medicine. 344 (22): 1688–700. doi:10.1056/NEJM200105313442207. PMID 11386269. ↑ Casas C, Herrando-Grabulosa M, Manzano R, Mancuso R, Osta R, Navarro X (Mar 2013). "Early presymptomatic cholinergic dysfunction in a murine model of amyotrophic lateral sclerosis". Brain and Behavior. 3 (2): 145–58. doi:10.1002/brb3.104. PMC 3607155 . PMID 23531559. ↑ Smith R, Chung H, Rundquist S, Maat-Schieman ML, Colgan L, Englund E, Liu YJ, Roos RA, Faull RL, Brundin P, Li JY (Nov 2006). "Cholinergic neuronal defect without cell loss in Huntington's disease". Human Molecular Genetics. 15 (21): 3119–31. doi:10.1093/hmg/ddl252. PMID 16987871. ↑ Karson CN, Casanova MF, Kleinman JE, Griffin WS (Mar 1993). "Choline acetyltransferase in schizophrenia". The American Journal of Psychiatry. 150 (3): 454–9. doi:10.1176/ajp.150.3.454. PMID 8434662. ↑ Mancama D, Mata I, Kerwin RW, Arranz MJ (Oct 2007). "Choline acetyltransferase variants and their influence in schizophrenia and olanzapine response". American Journal of Medical Genetics Part B. 144B (7): 849–53. doi:10.1002/ajmg.b.30468. PMID 17503482. 1 2 Mallard C, Tolcos M, Leditschke J, Campbell P, Rees S (Mar 1999). "Reduction in choline acetyltransferase immunoreactivity but not muscarinic-m2 receptor immunoreactivity in the brainstem of SIDS infants". Journal of Neuropathology and Experimental Neurology. 58 (3): 255–64. doi:10.1097/00005072-199903000-00005. PMID 10197817. ↑ Engel AG, Shen XM, Selcen D, Sine S (Dec 2012). "New horizons for congenital myasthenic syndromes". Annals of the New York Academy of Sciences. 1275: 54–62. doi:10.1111/j.1749-6632.2012.06803.x. PMC 3546605 . PMID 23278578. 1 2 Maselli RA, Chen D, Mo D, Bowe C, Fenton G, Wollmann RL (Feb 2003). "Choline acetyltransferase mutations in myasthenic syndrome due to deficient acetylcholine resynthesis". Muscle & Nerve. 27 (2): 180–7. doi:10.1002/mus.10300. PMID 12548525. 1 2 Bowen, R. "Terminal Transferase". Biotechnology and Genetic Engineering. Colorado State University. Retrieved 10 November 2013. ↑ Kumar B, Singh-Pareek SL, Sopory SK (2008). "Chapter 23: Glutathione Homeostasis and Abiotic Stresses in Plants: Physiological, Biochemical and Molecular Approaches". In Kumar A, Sopory S. Recent advances in plant biotechnology and its applications : Prof. Dr. Karl-Hermann Neumann commemorative volume. New Delhi: I.K. International Pub. House. ISBN 9788189866099. 1 2 3 Chronopoulou EG, Labrou NE (2009). "Glutathione transferases: emerging multidisciplinary tools in red and green biotechnology". Recent Patents on Biotechnology. 3 (3): 211–23. doi:10.2174/187220809789389135. PMID 19747150. ↑ Sytykiewicz H (2011). "Expression patterns of glutathione transferase gene (GstI) in maize seedlings under juglone-induced oxidative stress". International Journal of Molecular Sciences. 12 (11): 7982–95. doi:10.3390/ijms12117982. PMC 3233451 . PMID 22174645. ↑ Shintani D. "What is Rubber?". Elastomics. University of Nevada, Reno. Retrieved 23 November 2013. 1 2 "Development of Domestic Natural Rubber-Producing Industrial Crops Through Biotechnology". USDA. Retrieved 23 November 2013.